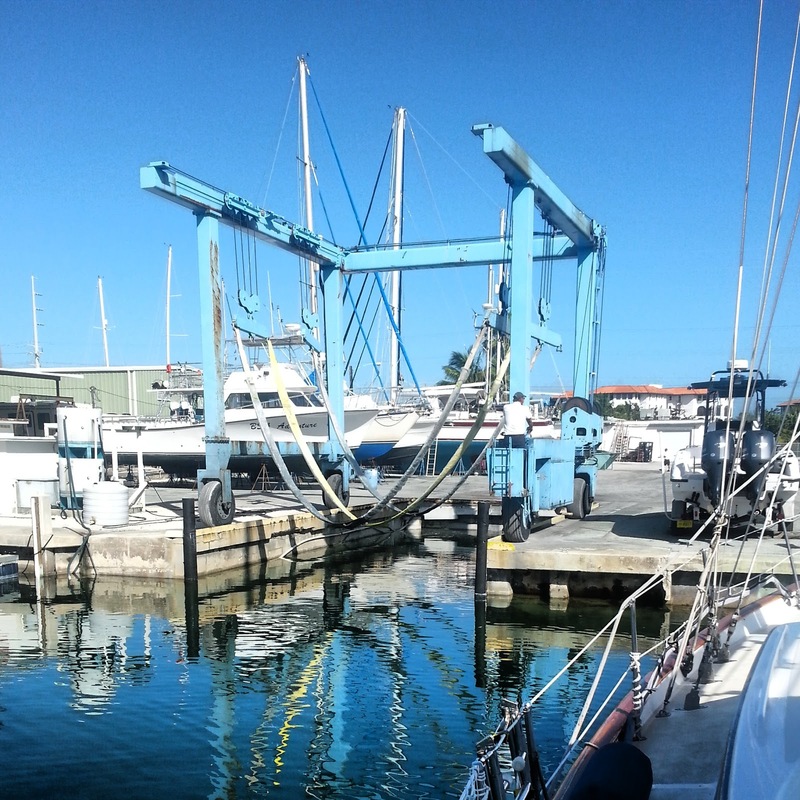 Today, we returned from a 9-day journey to the Florida Keys aboard Sea Gem. Well, mostly aboard Sea Gem. 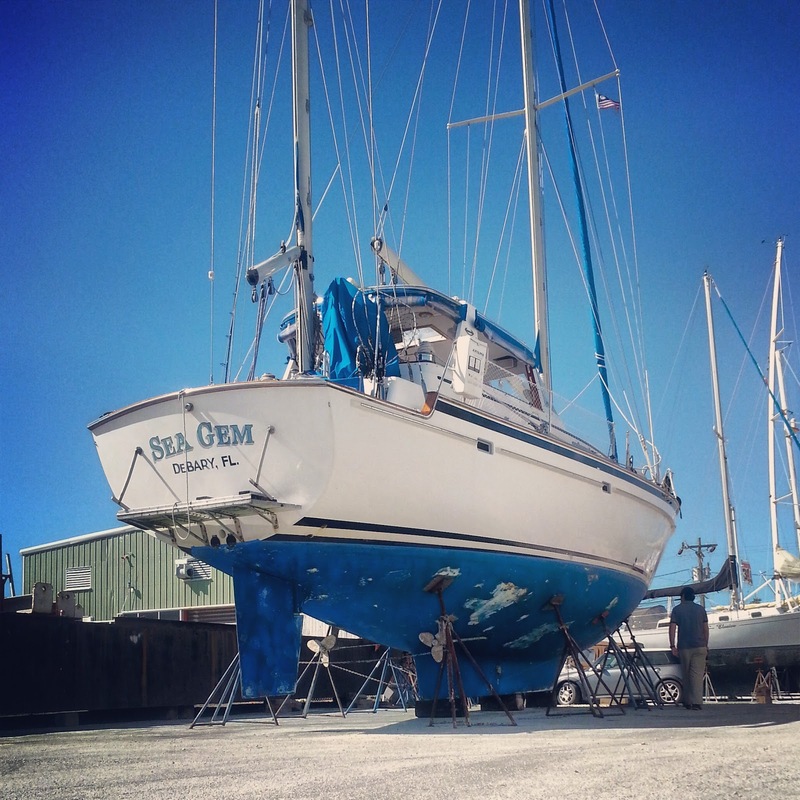 Although we had a full 9 days of vacation, Sea Gem spent 4 of those days "on the hard" (out of the water) having her bottom repainted. During that time, we rented a car and continued our vacation without her. All boats kept in saltwater have some sort of anti-fouling bottom paint to prevent growth of barnacles and other unwanted sealife, and after a couple years or so, the paint loses its anti-fouling properties and needs to be redone. Sea Gem's bottom was last painted 3 years ago, so the time was right for some brand-new, barnacle-killing paint. We also hadn't had Sea Gem hauled out of the water since we bought her 2-and-half years ago, so we had no idea what horrors we'd find. Giant barnacles? Fiberglass damages? Dented propellers? The process of hauling Sea Gem out (on slings hung from a giant boat-pulling machine called a travel lift) is also nerve-wracking. 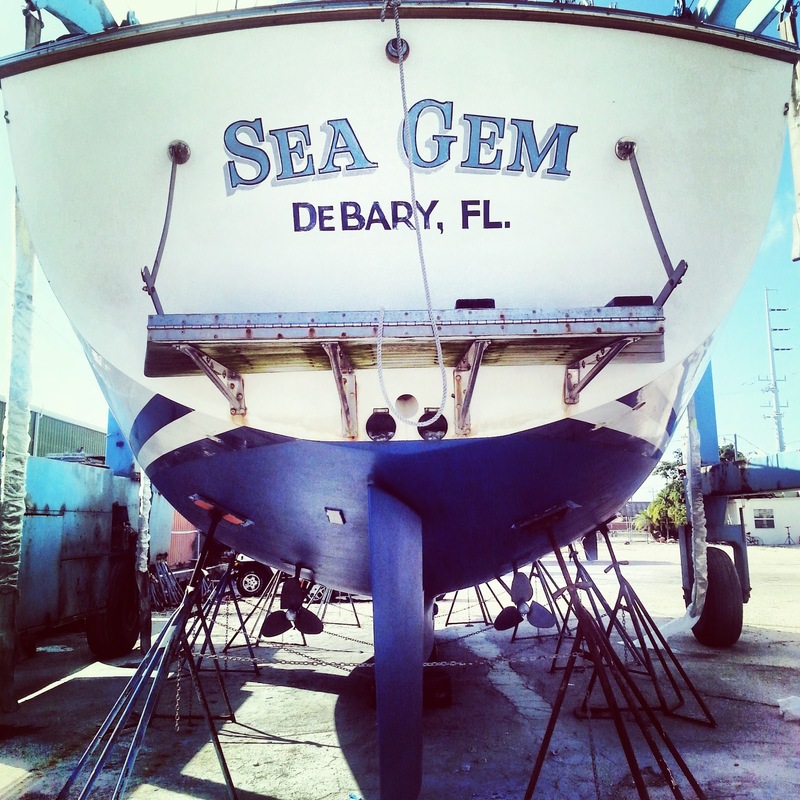 Sea Gem weighs 32 tons--what if a sling breaks or she slips off? Fortunately, the haul-out was uneventful and everything was in good repair. The bottom looked good (other than the worn-out paint), and nothing was damaged. The only unwanted surprise was the nylon rope of a lobster trap twisted around our starboard propeller shaft. (The lobster traps are tied to buoys floating on the surface so that they can be easily located and retrieved.) Since we ended up in a mine field of lobster traps on the sail down, it really was not much of a surprise that our propeller caught one. Fortunately, the propeller cut its way free and did not give us any problems on the sail down, and the remaining rope easily pulled away by hand. Perhaps the only victim of this story is the poor lobster stuck in a trap that will never be found. After our 4-day journey by car, we returned to find Sea Gem with a freshly painted bottom and ready to be returned to the sea. In what seemed like a few minutes later, we were back in the water and motoring away, ready to begin our two-day return sail back to Miami.